Apple is a ray of sunshine and will give you a very warm welcome when you walk through GVC’s front door. 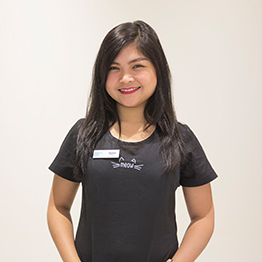 She joined the GVC as a receptionist in 2017, after a career working in a variety of sectors in the Philippines. There is nothing Apple loves more than chatting with and assisting GVC’s clients and she loves interacting with our animals. She is particularly fond of Scottish Fold cats and loves giving cuddles to all the dogs who pass by the reception. In her spare time, Apple loves playing video games, watching make-up tutorials, and exploring the UAE.